Enjoy Oktoberfest at Tommy’s Beer Cafe with Pork Knuckles, Pork Rolls and special Oktoberfest Beers. Don’t miss out and book a table today – Tommy’s Oktoberfest starts 22nd of September till end of October. 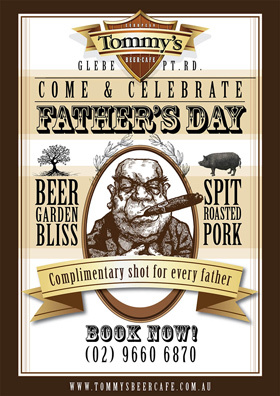 Come and celebrate Father’s Day at Tommy’s – with spit roasted pork and finest European beers on tap an event not to miss! April is duck-time at Tommy’s! And because of it’s huge popularity it’s an extended version going for 2 days from 14th to 15th April. Enjoy roasted duck & goose, duck liver and sweet wine. Mark the dates – Saturday & Sunday, April 14 & 15 – from 12pm to 12am – book a table now, it’s popular, don’t miss out! When was the last time you enjoyed an authentic Hungarian Goulash? Well, hold tight as Hungarian Kitchen Specials are coming at Tommy’s from February 12th to 18th, with traditional recipes prepared by authentic Hungarians! Book a table now call (02) 9660 6870 and come to Tommy’s to enjoy Goulash, Langosh, Halaszle Soup and many other goodies! 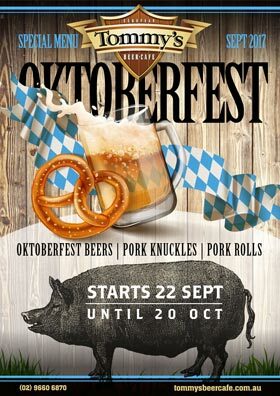 Don’t miss out and book a table today – Tommy’s Oktoberfest starts 22nd of September till 20th October. 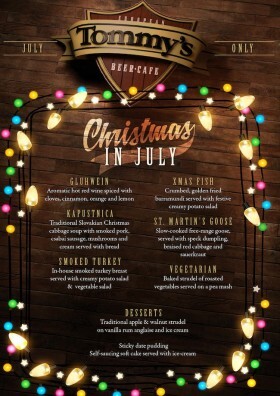 Come to Tommy’s to experience Christmas in July with yummy European food and drinks such as St. Martin’s Goose, Gluhwein, Kapustnica and moore. 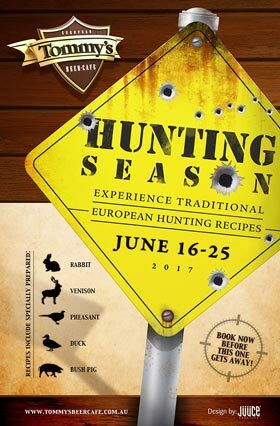 Book a table today – event in July only!